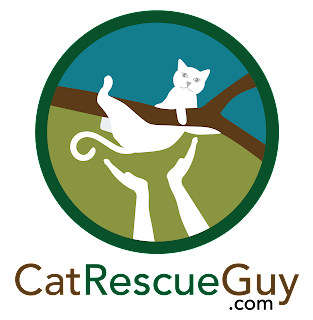 As a general rule, I don't do cat rescues at night. I need enough daylight to be sure that I install my rope on a healthy, sturdy branch before I can trust my life to it. However, if it turns dark after I am already in the tree, then I am comfortable with that as long as I don't have to re-position my rope where I can't see clearly. I would still rather wait for daylight, but if the situation is urgent enough, I will not hesitate to go. So when I got the call to rescue Anastasia late in the afternoon when a cold front was quickly pushing the temperature down to freezing, I rushed out the door. Anastasia had already spent one night in the tree, and I did not want her to suffer through another one, especially a windy, freezing one. It was late, but I had enough time to get there and set my rope in the tree before the daylight faded away. Plus, Anastasia was expected to be a cooperative cat so I was hoping for a quick rescue. When I arrived, I dropped my teeth when I saw where the cat was in the tree. I circled her extreme and precarious position in red in the picture. She was probably around 90 feet high at the tip of her branch, but, fortunately, she quickly demonstrated to me that she could walk most of the way down that branch. That was very encouraging, since it would be easier on me to reach her if she could meet me at least part of the way down that branch. The commotion I created while setting my rope in the tree frightened her all the way back to the tip top of her branch. I climbed up the main trunk till I was about 10-15 feet below her. I stopped and settled down there to give her time to calm down. My plan was to lure her down to me either with food or charm, but neither worked. She came down as far as two feet away from my outstretched hand, but that was all, and then she would head back up to the tip top. She did this several times. If it had been daylight, I could have easily climbed higher up her branch and been in reach of her with the rescue pole. But she is an all black cat, and in the darkness, all I could see was her silhouette, and I knew that I would not be able to see if I had the noose around her properly or not. The only option I had was to gain her trust and let her come to me. So I waited. And I waited. While I was waiting, the cold front continued to quickly blow in, and the temperature was plummeting. The brisk winds made it worse. I was beginning to shiver, and I knew I could not wait much longer. But the cat had already been in the tree one night, and I did not want her to have to endure an even colder one. Nor did I want to return in the morning. I thought it best to just wait her out. While I did so, I got the cat bag ready and used it for another layer of clothing on me to protect me from the cold wind. Since food and charm did not impress her enough, I decided to ignore her. That seemed to work. Once I sat quietly and put my attention elsewhere, she came closer. At last, she summoned the courage to come down close enough to sniff my outstretched fingers. Then back she went. I waited a little longer, and she came back down again. Again she sniffed my fingers, and this time she let me touch her gently on her cheeks. That was all she needed. She came down all the way to me and let me pet her thoroughly. I scruffed her and then pulled the bag over her. She handled it all without so much as a whimper. It was almost as if she was expecting it. I think she was just glad to get out of the cold wind. I took her down and released her inside the house. She immediately ran off out of sight, but later she returned, and I got my first good look at her in the light. 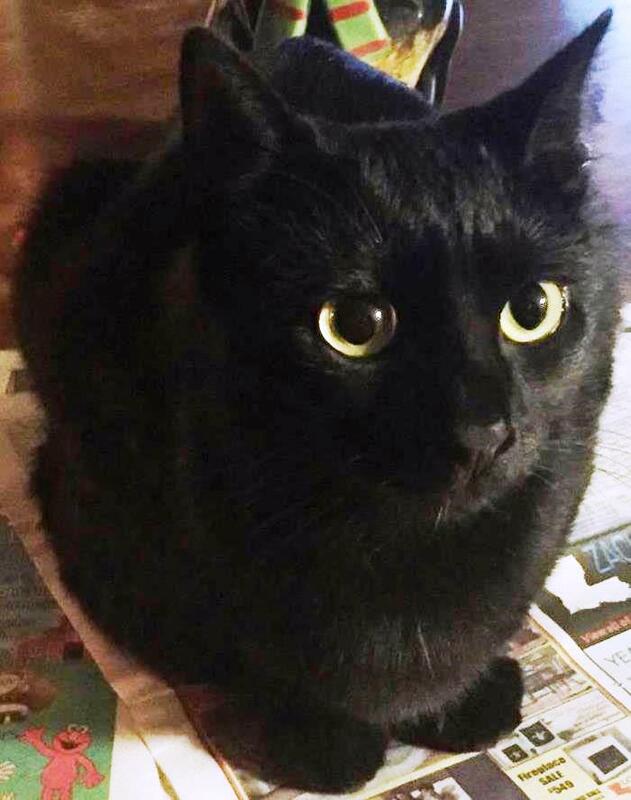 She has a beautiful, shiny black coat and pretty, piercing eyes. She was glad to be home where the food, water, warmth and loving are. And I was ready to go home for some warmth too. Total elapsed time from my arrival to her release: 3 hours. There is no video because it was too dark.